Mount Fitz Roy is one of the exciting views of the diverse and rich natural area of Patagonia. Located in southern Argentina, Fitz Roy has a snow caps mountain challenge for very experienced climbers and adventurists from all over the world. Fitz Roy massif is part of the Andes. It is located in southern Patagonia, on the border between Argentina and Chile. Patagonia is often called "doomsday" and one of the main reasons for this name to be used by so many mountaineers, climbers and photographers is precisely Fitz Roy and Cerro Torre. Local people know the name of Fitz Roy as Cerro Chaltén or literally "smoking mountain". Natives give this name to the mountain range, because almost all the time the tip is covered by thick clouds. It is a favorite of many photographers because of its interesting notched shape. 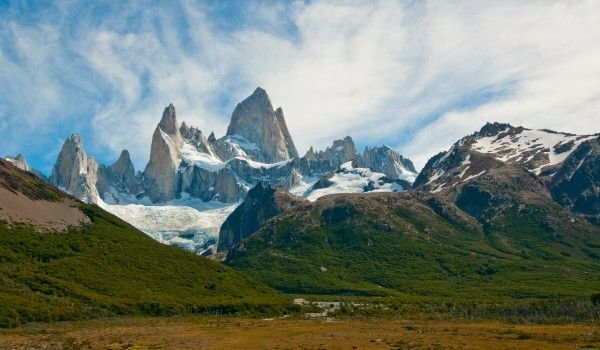 Fitz Roy started gaining popularity when, in the 70s, the world renowned mountain gear company Patagonia elected it as a logo. Mount Fitz Roy reaches an amazing 3375 meters altitude and is the highest point in the National Park Los Glaciares, occupying 6, 000, 000 square km, consisting of mountains, glaciers and lakes in the province of Santa Cruz, in the southern part of Argentina. Most of the park is inaccessible to visitors, with the exception of two areas - the Fitz Roy area near the town of Chalten and the region Perito Moreno – the National Park in northwestern Patagonia, placed on the list of UNESCO for World Cultural and Natural Heritage Sites. The city of El Chalten is a starting point for conquering two of the most impressive peaks of the Andes - Fitz Roy and Cerro Torre. The first successful ascent of Fitz Roy was in 1952 by Frenchmen Lionel Terray and Guido Magnone, who climbed the South-Eastern edge - ie. Franco-Argentine route. Though not particularly high, Fitz Roy is considered a serious challenge for experienced climbers. The respectable reputation of the mountain is because of its high granite walls with long, skillful passages that are often coated with a layer of ice because of the humid climate. Particularly difficult to overcome are the snowy "hats" in which climbers must dig tunnels. Further complicating the conquest of Fitz Roy circumstances is the extremely variable weather conditions that often lead climbers to wait at base camp for weeks. Statistics derived from these factors indicates that Fitz Roy is rarely conquered. Perhaps you recognize the steep jagged cliffs of the Fitz Roy from the Werner Herzog film, Scream of stone, 1991. Made because of an idea by Reinhold Messner, this film features climbing by some of the world’s best climbers and movie celebrities such as Donald Sutherland, Vittorio Mezojorno, Mathilda May, Hans Kamerlander and others. To reach the town of Chalten, it is best to take a bus from El Calafate. In high season the village is literally crowded, so you should consider pre-booking if you want to stay at the foot of Fitz Roy. Opportunities to walk in the park are many, and 6-day trips are most often carried out. The best time to visit this part of Patagonia, is from December to March.